“MoPNG e-Seva is an e-Seva portal that will serve as a single point for queries on Twitter and Facebook to begin with and other social media platforms in due course” - Ashutosh Jindal, Joint Secretary in the Ministry of Petroleum and Natural Gas. “Customer convenience is our top priority; MoPNG e-Seva is a grievance redressal platform made to provide efficient solutions to the customers” - Minister of State for Petroleum and Natural Gas, Dharmendra Pradhan. Minister of State for Petroleum and Natural Gas (Independent Charge), Dharmendra Pradhan launched on March 24, 2017 “MoPNG e-Seva”, - an online dedicated grievance redressal social media platform to help resolve the grievances, issues and problems of the customers of Oil & Gas Sector within a time frame of 48 hours or earlier from the logging in of the complaint. 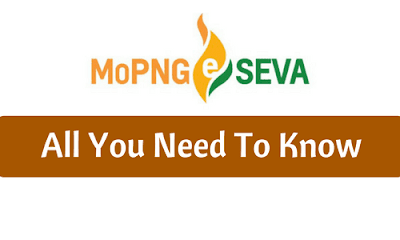 Ministry of Petroleum and Natural Gas e-Seva (MoPNG e-Seva) will initially serve as a single point of contact for all queries on Twitter and Facebook. This service would be extended to other platforms shortly in due course. The Ministry ran a pilot trial for about a week before formally launching this online service. This e-Sewa would cover all segments of the Oil & Gas Sector covering CNG, LPG, PNG, Diesel, Kerosene and Petrol among others. The prime motto of this service is in case any customer is having any issue or query about LPG, CNG, PNG supply or the supply of Kerosene at any Government Depot, or the supply of Diesel and Petrol at any petrol pump, throughout India, the customer is just to write about the same on the social media for immediate redressal through the Oil Ministry's this latest e-initiative. This MoPNG e-Seva would serve as a single-point interface allowing the consumers of Oil & Gas Sector to express their complaints, grievances. A team of Nodal Officers from Government-run Oil Companies and Allied Services have been formed to monitor and track conversations and to address the complaints, grievances and queries in real time providing 24x7 help. The customer is required to provide his/her name, LPG Consumer No., LPG Dealer’s Name or the Name of the Petrol Pump and to which company that belongs along with the location - so that the complaint/issue/grievance is quickly redressed. A standard operating procedure has been initiated for immediate intervention by the Executive Officers of the concerned oil companies, under the Ministry of Petroleum & Natural Gas. It must be noted here that the companies in the Oil & Gas Sector deal with nearly 3.5 Crore customers daily, which is higher than that of any organised retail chain or even the entire banking sector. Thus, there was a long pending need of such a platform to be responsive towards the customers’ complaints and queries. More than 100 complaints have already been resolved within a day of the launch of this e-Sewa. This itself proves how much helpful and useful this e-Sewa would prove in resolving issues of the customers. The normal traditional channels for receiving complaints and grievances and redressal thereof would remain continued. It may be noted that the Ministry of Petroleum and Natural Gas under Narendra Modi Government has already been focusing on customer care service through several measures with a dedicated team of the Ministry quickly responding to complaints reaching the Minister or the Ministry. MOPNG e-Seva will thus serve as an exclusive integrated portal that would handle queries received on the official handles of the Oil Minister as well as of the Ministry of State for Petroleum and Natural Gas.